Looking for a very last minute gift? 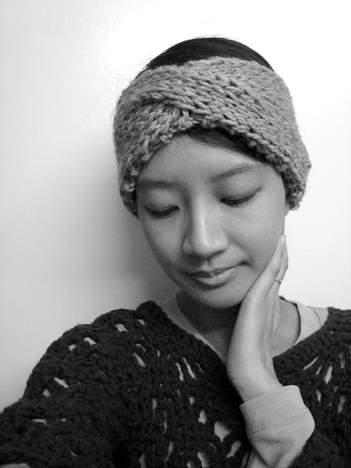 This headband took me just one hour to make, and I don’t even knit very much. Perfect for this snowy weather we have going on these days! It’d probably look better on someone with longer hair, but it’s really quite cozy. I used 10 mm straight needles, 1 strand shetland chunky and 1 strand worsted weight yarn held together, a cable needle, and tapestry needle. Repeat rows 1 and 2 until piece is 8.5 or 9 inches long, end with row 2. Cable row: knit first stitch, place next 5 stitches on cable needle, knit the following 5 stitches, knit the five stitches on the cable needle, knit last stitch. Repeat row 2, then row 1 and 2 until entire piece is 17 or 18 inches long, bind off. Sew the ends together. 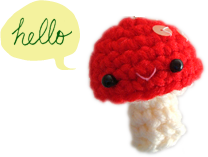 The post on The Knit Cafe has a nice photo tutorial for seamless join (scroll down for the seaming tutorial). I’m making a super chunky infinity scarf for my niece (her birthday is on Christmas) and wanted to make a matching head band *because she won’t wear a hat* so this is perfect! Did I mention I haven’t started knitting either one yet? We’ll see how this goes! Made the infinity scarf in about 2 hours and the headband (with super chunky on 35 mm needles) and it was about half an hour. Thanks for the inspiration and Merry Christmas to you! Very cool picture of you, Trish!